The Fish: 7 Platies, 6 Rasbora Harlequin, 5 Cardinals tetra, 2 Common Pleco (one 7 inch and the second 5 inch), 2 Rainbow Frucata (Pseudomugil), 6 Glowlight Tetra, 1 otto. Plants: 2 Amazons, 15 Polysperma, 4 Polysperma (the red ones), 1 Diformis, 1 Java Moss attached on wood, 1 Crypt, 1 Crinum calamistratum, 1 Anubia in substrate. Co2:One bottle DIY system on 24 hours...recipe changed each 2 weeks. Lighting: Flora glo and Power Glo (T-10) for 8 hours and a half (pin-timers). Each one turns on and off with a 30 minutes interval. 50 watts = 1.9 wat per gal. 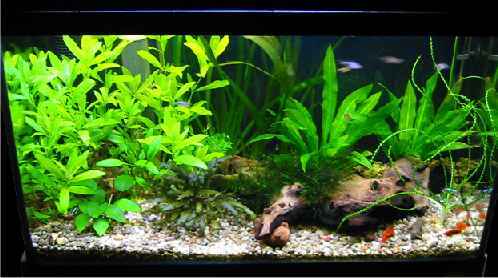 Fertilizers:TMG (Tropica master grow) 5ml added each other day, LeafZone 10 ml at water changes. Added Root tabs Iron plus tabs in the substrate which already has Terralit, Fereal (liquid iron supplement)added when needed only.